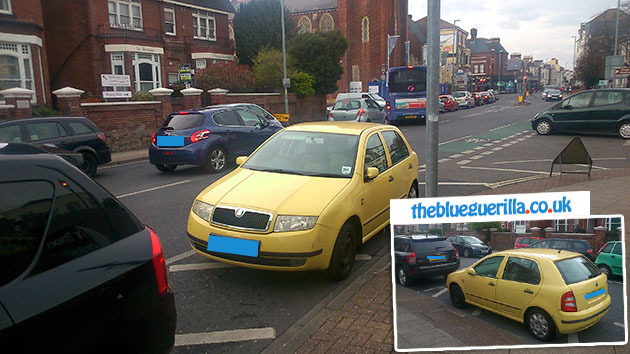 TheBlueGuerilla: More Illegal Lib Dem Parking. A PORTSMOUTH Liberal Democrat Councillor has been caught parking illegally, just behind the doctors bay where his boss and MP for Portsmouth South Mike Hancock was snapped illegally parking by TBG paparazzi last year. Owner of the yellow Skoda Councillor Michael Andrewes runs Mike Hancock’s office and allegedly "writes all his letters for him". The sensational images were captured on the corner of Victoria Road South and Albert Road at 16:10 yesterday, Wednesday 26 March. Barely a story. Who is the quote from? Where's the proof this is his car? Even if it is accurate who cares? Donna Jones has stooped veeery low allowing this 'story' to come out. Yes, I've seen Mike Hancock's car there numerous times. On one occasion, when (three!) Parking Attendants were ticketing a vehicle outside the Chippy in Albert Road, I alerted them to MH's vehicle parked illegally round the corner. Once they'd (all) finished outside the Chippy one of them went to take a look-see and .......... did absolutely nothing other than walk away from it. Have they been told to 'ignore' certain vehicles? Ah the great Portsmouth Traffic Warden Conspiracy. Stop talking rubbish. This is poor all round.